Mindful meditation is the practice of bringing your awareness to the present moment. As strange as it may sound just by focusing your attention on being present you can experience a sense of instant calm, peace, and clarity. All it takes is a willingness to let go of the busy mind for a few moments so you can start to unwind. 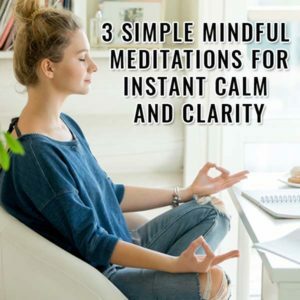 Before we get started on the meditation techniques I’d like to give you a couple of tips on how to get the most out of your meditation practice. The first tip is that if the mind wants to chatter that’s okay, that’s what it’s supposed to do. Just accept it, and then keep bringing your attention back to the meditation technique you are using. The second tip is to not worry about meditating the ‘right’ way. Instead, commit to practicing it on a regular basis so you can see if it’s something that is going to work for you. If too much emphasis is on meditating the right way then that’s just putting extra pressure on yourself that will get in the way of keeping your practice simple and fun. The results are sure to happen a lot faster if you just relax and trust the process. Paying attention to your body is an easy way to get out of your head and center yourself with almost no effort. Because the body exists in real-time, whereas the mind is constantly moving from the past to the future. Focusing on your body in a mindful way is a fast way to unwind the mind and feel relaxed. This method involves closing your eyes and focusing your attention on the center of your left palm. If you can, have a seat while you’re doing this with your palm facing upwards on your lap. When the mind wanders, just gently bring your awareness back to the center of your left palm. If you notice that your palm gets warmer, starts to tingle, or has energy moving in it then just allow it as that is perfectly normal. Do this for a minute or two before opening your eyes. We are hearing sounds all day long, most of which the brain filters out as we decide what’s important to listen to and what’s just a bunch of white noise to be ignored. This doesn’t mean however that the sounds you are picking up on are not having an impact on your stress and anxiety levels. This method involves sitting, standing, or even lying down quietly with your eyes closed for a minute or so. Once you’ve closed your eyes then pay attention to the sounds that you can hear going on around you. The key here is to just notice the sounds without labeling them or judging them in any way. Just let your attention drift from one sound to the next and if your mind wanders to any thoughts or feelings simply allow them. Then gently bring your attention back to the sounds you can hear around you. To notice your feelings is a powerful tool to help you enjoy more peace of mind. We spend so much time thinking that just making a shift from thinking to feeling helps to get us back in touch with real life. This is a fun technique that you can pretty much do anytime and anywhere once you get the knack of it. The easiest way to shift from thinking to feeling is to focus on breathing from the heart. Just take a deep breath right into the middle of your chest and feel as if you are filling your heart center with vital life energy from the Universe. Feel this vibrant energy pouring into your heart space. Then, exhale deeply from your heart center, and feel that you are giving back the same amount of energy to the Universe. Take at least five breaths at once to help with moving from the head to the heart, and do it as often as you like during the day. These techniques will work whether you are new to meditation or a seasoned pro. You also don’t need to spend a lot of time practicing them as even one to two minutes will help clear your head and enjoy more focus. Of course, you can always extend them to longer lengths of time if you want and enjoy even more benefits of deeper meditation practice.